The global market for influenza medication is displaying a highly competitive business structure, finds a new research study by Transparency Market Research (TMR). Daiichi Sankyo Co., GlaxoSmithKline plc, Natco Pharma, F. Hoffmann-La Roche Ltd., Teva Pharmaceutical Industries Ltd., Sandoz International GmbH (Novartis AG), Sun Pharmaceutical Industries Ltd. and Mylan Inc. are some of the prominent players operating in this market. However, only a few players have acquired the leading position, making the business landscape in this market moderately consolidated. The leading vendors of influenza medication are expected to take up strategic partnerships, states the market study. According to the research report, the global influenza medication market was worth US$1.69 bn in 2016. Expanding at a CAGR of 1.40% during the period from 2017 to 2025, the market is projected to reach US$2.01 bn by the end of the forecast period. zanamivir, oseltamivir, peramivir, amantadine, rimantadine, and inosine are the main products available in this market. Among these, the oseltamivir segment is leading the global market. 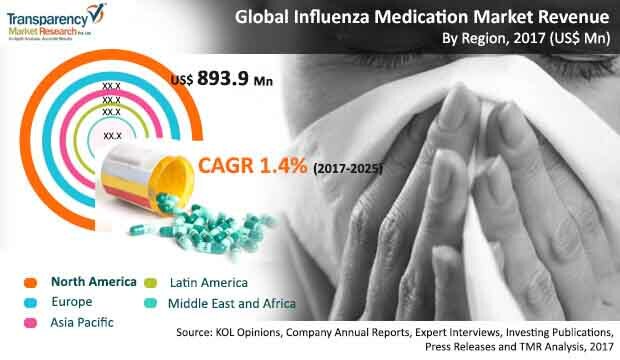 On the basis of the geography, the global market for influenza medication has been segmented into North America, Asia Pacific, Latin America, the Middle East and Africa, and Europe in this research report. Among these, the markets in North America and Europe has acquired the dominance, thanks to the presence of a better medical and healthcare infrastructure. These regional markets are anticipated to remain on the top over the next few years. The presence of leading players are likely to support these regional markets. The increasing uptake of high-cost therapies has spiked prospects for the influenza medication market in North America. The U.S. dominated the Influenza medication in North America, accounting for nearly 49.8% share in 2016. Asia Pacific and the Middle East and Africa are also expected to witness a significant rise in the years to come, states the research report. “The global influenza medication market is gaining from the increasing incidence of influenza and infections across the world,” says a TMR analyst. Besides this, the presence of favorable government policies relating to the prevention and treatment of influenza is also supporting the market’s growth trajectory. In emerging markets, such as Asia Pacific, the market for influenza is likely to gain from the rising incidence of ailments and availability of healthcare facilities at a low cost in the years to come, states the report.